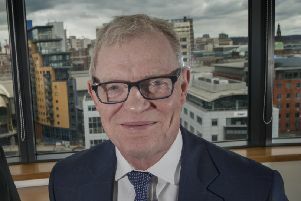 Sheffield University bosses says they are “confident” a £20m construction project will be completed by Interserve despite its financial difficulties. The construction and services firm has reached an “agreement in principle” with lenders over its financing following a period of tough trading. The Heartspace is a Bond Bryan Architects design. Interserve which employs 25,000 people in the UK and 80,000 globally, could cut up to 1,000 jobs this year after shedding 500 administrative jobs in 2017. It is building the ‘Heartspace’ for the engineering faculty, a glass roof connecting the Grade II listed Mappin Building with the 1855 Central Wing. In January, construction and facilities management firm Carillion went out of business with debts of £1bn and a £580m pension deficit after the banks refused to lend any more money. The collapse affected 20,000 workers including 250 at a Sheffield call centre. Thousands of suppliers were also hit. The Interserve site on Mappin Street. The firm is experiencing financial difficulties. The roof links engineering faculty buildings.